Alright, both the bookmarklet and sidebar thingy are awesome. I have wanted a floating web version of the IM client since you (Google) came out with the version in gmail. I feel special now, as if you (google) listened to my suggestion. Now, I am not naive enough to think I was the only one who thought of that, but this still rules!! Thanks and tell everyone who worked or works on this thank you. This is pretty stellar. Some questions though. 1) Can I send args from the browser window to the Flash applet? 2) If I know the user's username & password can I auto log them in? 3) If false to #2 - Does it work with Google's AuthSub authentication token scheme? 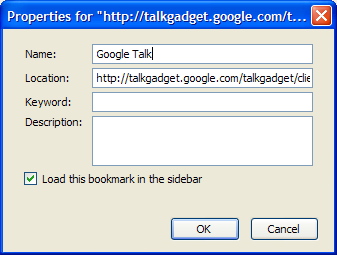 4) When is GTalk going to get it's own API? I'd love to have a REST or SOAP service I can send messages (in the loosest form) to and send IM's, get stati, send files, etc. Thanks for your findings, I used it to make a firefox gtalk sidebar extension. Is there a way to hide offline contacts that you know off? Slightly off topic, GTalk is blocked at work so I looked for some other web-based GTalk compatibles. Most of the common ones are blocked, does anyone know of some more obscure ones?